Masing (third left) holds the winding-up speech for the Ministry of Infrastructure Development and Transportation, which he heads, after presenting it during the DUN sitting. With him are (from left) Assistant Minister of Water Supply Datuk Liwan Lagang, Samalaju assemblyman Majang Renggi, Tamin assemblyman Christopher Gira, Ministry of Infrastructure Development and Transportation permanent secretary Datu Safri Zainudin, Assistant Minister of Industries and Investment Malcolm Mussen Lamoh and Assistant Minister of Native Laws and Customs Datuk John Sikie Tayai. KUCHING: The Pan Borneo Highway project, which began construction in late 2015, had reached 33 per cent physical progress as at end of September this year. Deputy Chief Minister II Tan Sri Datuk Amar Dr James Masing, who stated this, said the 786km stretch of the project from Telok Melano in Sematan to Miri is divided into 11 works packages, and most of the works packages are into full gear towards completion on time. “Implementation of this single largest infrastructure project in Sarawak is now midway in its construction, as reported by the project delivery partner (PDP). The project, which is targeted to complete in 2021, has currently achieved 33 per cent physical progress – as at end of September 2018,” Masing, who is Minister of Infrastructure Development and Transportation, told the august House in his winding-up speech yesterday. Masing also pointed out that while certain works packages had faced some challenges due to unfavourable weather conditions, utilities relocation, works constraints on manpower and machinery, as well as a few land issues that remained unresolved, the overall project is still on track. 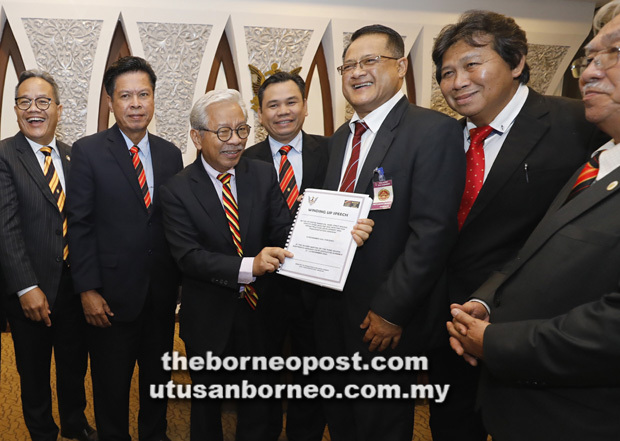 Masing also told the House that his ministry had received a letter from Ministry of Works on Nov 1, to consider the Sabah-Sarawak link as an alternative route from the Pan Borneo Highway Phase II. Masing pointed out that his ministry supported the proposed road projects and would submit the proposal to the State Planning Authority for further deliberation.